The youngest is a schoolboy from Blackburn who was 14 when he incited an act of terrorism in Australia. The figures also show there are growing numbers of women and girls being prosecuted. Police say five terror plots have been foiled since March and 18 thwarted since 2013. For the last two years the BBC has tracked the numbers of people from the UK who have been drawn into the conflict in Syria and Iraq. The most comprehensive online record of its kind, it shows the rapidly escalating number of prosecutions since 2014. Those convicted come from a wide cross section of society and include former prisoners, a hospital director and the son of a police officer. Married couples, siblings and a mother of six have also been prosecuted. Of the 109 people convicted, 18 (16%) were women and girls and interestingly, over 85% of those convicted have never been to Syria or Iraq. That's because some of the offences relate to those who have plotted to go and fight but who were arrested before putting their plans into action. Others have been convicted of using social media to encourage support for banned groups such as Islamic State. Director of Public Prosecutions, Alison Saunders told the BBC: "We need to be acutely aware that if people can't go to Syria - and we have certainly seen this in some of the cases we have prosecuted - they may plan a sort of an attack here instead or they may do more to radicalise other people here to attack so we need to be very aware of that." The DPP says the Crown Prosecution Service has the resources it needs to deal with the increased number of cases. After the London Bridge attack in which eight members of the public were killed, the prime minister called for a review of Britain's counter-terrorism strategy to make sure the police and the security services have the powers they need. Meanwhile, the Ministry of Justice (MoJ) has announced that some of the country's most dangerous extremists have been moved to a "prison within a prison". The inmates have been relocated to what the MoJ has called 'separation centres' within HMP Frankland in County Durham. The move was promised by the then-Justice Secretary, Liz Truss, after a report into Islamist extremism in prisons. 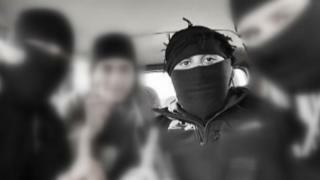 Could teen jihadist have been saved from himself?